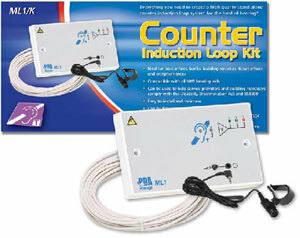 View details on the ML1/K Counter Induction Loop Kit below or download the specification sheet. SigNET's new ML1/K counter induction loop kit is ideal for use in post offices, banks, building societies, ticket offices and reception areas. Comprising a compact wall-mounting double gang induction loop amplifier, a self-adhesive microphone and pre-formed counter loop, it can generate a loop listening field of approximately 1.2m2 making it ideal for ticket booths, desktops and tables. In addition to its 3.5mm microphone input, the ML1 amplifier also features a balanced line level input, loop strength, input peak and mains on indicators and a selection of user and engineer adjustable controls. As well as being used as part of the ML1/K counter loop system, the ML1 is capable of covering rooms up to 20m2 (approx. 4.5m x 4.5m) using a loop made from four core burglar alarm cable wired as four turns.